they named him after a Sūtra: Bumkyab, meaning "Protected by the Hundred Thousand Verse Prajñā Pāramitā," the lengthiest version of the Prajñā Pāramitā Sūtra. When his two younger brothers were born they were similarly named for 2 shorter versions of the Sūtra, Protected by the 10 Thousand, Trikyab and Protected by the 8 Thousand, Gyetong Kyab. The father's name was Tonpa Jungne Lodro and his mother's name was Jomo Lochungma. and received the name by which he would from then on be known, Darma Wangchug. In his teens he studied with teachers of the Kadam lineage, Chayulwa Chenpo Zhonnu O being the most famous one, concentrating on teachings of Atiśa, Maitreya and Āryadeva. He also studied with Drolungpa Lodro Jungne, and Potowa Rinchen Sal. Already in his younger years he had heard of the fame of Gampopa Sonam Rinchen (1079-1153), and during his studies he conceived the strong desire to become his disciple. Joining with a friend in the monastery, they took offerings of tea and gold with them to Daklha Gampo where Gampopa resided. His skin broke out in boils and the pain was unbearable. He dreamed of a black lake filled with fish and tadpoles, thinking he would jump into it. "Fierce veneration is the ground for interdependent connections. Keep holding on with the hook of compassion. Rise to the level of unchanging bliss." The dream ended with the two of them soaring into space -- the dream being an allusion to the guru-disciple relationship - and when he awoke the illness had entirely disappeared. In 1153 Gampopa presented Darma Wangchug with a piece of gold and advised him to go and meditate at a hermitage in Barom. Not wishing to leave his elderly teacher, he declined to accept the gold and asked to serve him as long as he would live. Soon after Gampopa passed away, and Darma Wangchug stayed on long enough to make an 100 000 clay images, or tsatsas, containing the ashes of his teacher's body. Only then did he follow his teacher's advice and went to meditate at Barom, in Nagqu. During his 7 year retreat, which began in 1154, he saw no human beings with the single exception of the person who brought him provisions from time to time. He is said to have had plenty of visitations by non-humans, including the local protective spirits, in particular the one called White Layman. During his time he composed a large number of songs, in the tradition of Milarepa (1040-1123). During his time there the community grew into what became known as Barom Monastery. Following his retreat he went 3 times to Kham, where he gained the patronage of local rulers and attracted many disciples. He also established several monasteries, including Kotso and Lode. At a place called Chiwar Lhakhang he met and blessed a young boy who later returned to him and became his chief disciple, Tishri Repa Sherab Sengge (1164-1236). Darma Wangchug returned to U and was made head of the monastic community at Barom. 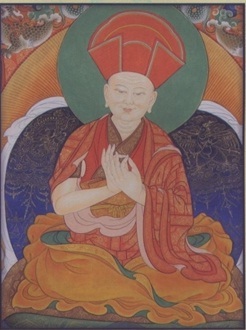 and Jigten Sumgön (1143-1217), the founder of Drigung Monastery. According to tradition, his disciples saw plentiful evidence of his remarkable abilities, which included invisibility, foreknowledge and miracles like walking through walls as if through air. His death, around 1194, at the age of 72, was said to have been accompanied with numerous signs and visions. Barompa Darma Wangchuk’s disciple, Tishri Repa Sherab Senge (1164-1236), was a preceptor to the Tangut rulers before Genghis Khan conquered that kingdom in 1226 and he was forced to flee. A more recent master in the lineage was Tulku Urgyen Rinpoche (1920-1996), who lived and taught in Kathmandu. His son, Chokyi Nyima Rinpoche (b.1951), the founder of Ka-Nying Shedrub Ling Monastery in Kathmandu, Nepal. and the Rangjung Yeshe Institute, is also a Barom Kagyu lineage holder.